Although nanoscale twinning is an effective means to enhance yield strength and tensile ductility in metals, nanotwinned metals generally fail well below their theoretical strength limit due to heterogeneous dislocation nucleation from boundaries or surface imperfections. Here we show that Au nanowires containing angstrom-scaled twins (0.7 nm in thickness) exhibit tensile strengths up to 3.12 GPa, near the ideal limit, with a remarkable ductile-to-brittle transition with decreasing twin size. This is opposite to the behaviour of metallic nanowires with lower-density twins reported thus far. 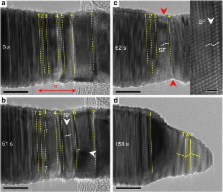 Ultrahigh-density twins (twin thickness<2.8 nm) are shown to give rise to homogeneous dislocation nucleation and plastic shear localization, contrasting with the heterogeneous slip mechanism observed in single-crystalline or low-density-twinned nanowires. The twin size dependent dislocation nucleation and deformation represent a new type of size effect distinct from the sample size effects described previously. Low-dimensional materials containing defects such as twin boundaries are known to fail well below their theoretical strength due to surface imperfections. Here, Wang et al. observe strengths close to the ideal limit in gold nanowires with angstrom scale twins, where homogeneous dislocation nucleation controls deformation. Revealing the maximum strength in nanotwinned copper. The strength of polycrystalline materials increases with decreasing grain size. Below a critical size, smaller grains might lead to softening, as suggested by atomistic simulations. The strongest size should arise at a transition in deformation mechanism from lattice dislocation activities to grain boundary-related processes. We investigated the maximum strength of nanotwinned copper samples with different twin thicknesses. We found that the strength increases with decreasing twin thickness, reaching a maximum at 15 nanometers, followed by a softening at smaller values that is accompanied by enhanced strain hardening and tensile ductility. The strongest twin thickness originates from a transition in the yielding mechanism from the slip transfer across twin boundaries to the activity of preexisting easy dislocation sources. Stacking fault energies and slip in nanocrystalline metals. The search for deformation mechanisms in nanocrystalline metals has profited from the use of molecular dynamics calculations. These simulations have revealed two possible mechanisms; grain boundary accommodation, and intragranular slip involving dislocation emission and absorption at grain boundaries. But the precise nature of the slip mechanism is the subject of considerable debate, and the limitations of the simulation technique need to be taken into consideration. Here we show, using molecular dynamics simulations, that the nature of slip in nanocrystalline metals cannot be described in terms of the absolute value of the stacking fault energy-a correct interpretation requires the generalized stacking fault energy curve, involving both stable and unstable stacking fault energies. The molecular dynamics technique does not at present allow for the determination of rate-limiting processes, so the use of our calculations in the interpretation of experiments has to be undertaken with care. Copyright statement: Copyright © 2013, Nature Publishing Group, a division of Macmillan Publishers Limited. All Rights Reserved. Void-assisted plasticity in Ag nanowires with a single twin structure. Experimental-computational investigation of ZnO nanowires strength and fracture. Enabling ultrahigh plastic flow and work hardening in twinned gold nanowires.